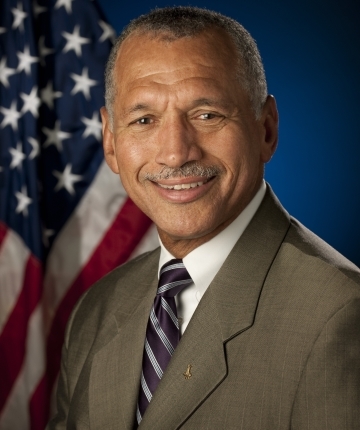 Born in 1946, Charles Frank Bolden Jr. is a former Administrator of NASA, a retired United States Marine Corps Major General, and a former NASA astronaut. Selected by NASA in May 1980, Bolden became an astronaut in August 1981. His technical assignments included: Astronaut Office Safety Officer; Technical Assistant to the Director of Flight Crew Operations; Special Assistant to the Director of the Johnson Space Center; Astronaut Office Liaison to the Safety, Reliability and Quality Assurance Directorates of the Marshall Space Flight Center and the Kennedy Space Center; Chief of the Safety Division at JSC; Lead Astronaut for Vehicle Test and Checkout at the Kennedy Space Center; and Assistant Deputy Administrator, NASA Headquarters. A veteran of four space flights, he has logged over 680 hours in space. Bolden served as pilot on STS-61-C (1986) and STS-31 (1990) and was the mission commander on STS-45 (1992), and STS-60 (1994). Bolden was the first person to ride the Launch Complex 39 slidewire baskets which enable rapid escape from a Space Shuttle on the launch pad. The need for a human test was determined following a launch abort on STS-41-D where controllers were afraid to order the crew to use the untested escape system. A few years before his appointment by President Barack Obama to be the administrator of NASA, Bolden auditioned, along with professional actors, for the role of virtual host for NASA’s “Shuttle Launch Experience” educational attraction at the Kennedy Space Center Visitor Complex in Merritt Island, Florida. On Jan 12, 2017, Bolden announced his resignation from NASA during a Town Hall meeting at NASA Headquarters in Washington D.C. His last day would be January 19, and Robert M. Lightfoot Jr. was announced as acting NASA Administrator. For availability and speaker fees, please contact Charles Bolden’s speaking agent at Chartwell here, or call +1 972 385 1021 for U.S. inquiries or +44 207 293 0864 for international inquiries.